Growing up, I had the privilege of frequently going to the best restaurants, even as young as 4 or 5. Whether these restaurants were in my hometown of Birmingham, Alabama, or wherever we were vacationing as a family, my parents would tote us along to any of the fabulous places they wanted to eat. At the time, I did not appreciate this luxury, but looking back today I have some of my fondest family memories around the tables of great restaurants. I give many thanks to my parents for this exposure that continues to be a passion of mine today. I find such joy in a good meal at a great restaurant. It is funny how the passions or interests of your parents trickle down to you as you become an adult. One (two technically) of the places that feel like home to me are Bottega Restaurant and Café. The executive chef and owner, Frank Stitt, creates more magic between these two restaurants than you could dream. Additionally, the memories that I have here to pair with the amazing food I have consumed are simply irreplaceable. Special occasions such as birthdays, graduations, proms, engagements, and just sheer family time take place here for my family and I more often than not. I really don't know what we would do without this place! One in a million, that is for sure. With all this love of Bottega being said, Frank's cookbook, Bottega Favorita, highlights some of his best dishes from both the Restaurant and Café, allowing those of us dreaming of these meals from afar the ability to create them at home. After talking recently with one of my friends about our love for Bottega, my mind went to one of my favorite appetizers from the Café, Roasted Peppers with Goat Cheese. While I do not believe that this dish is on the current menu, it was a favorite for years! I cannot tell you how many nights were spent on the patio of the Café side with my best friends eating this appetizer. Oh how food can draw out the best memories. Had to get a shot of the delicious inside. The cheese melts and all the flavors blend together in the oven. Be sure when you toast your pine nuts to watch carefully. My mom always made this one salad growing up that had toasted pine nuts in it. I really can't tell you how many times I watched her burn those nuts! Almost every time. I am telling you this laughing, I love my mom she's a wonderful cook, but I think about her consistent burning of pine nuts each time I pop some in the oven! WATCH CAREFULLY. I mean, a few seconds too long and they're black. Still thinking about these peppers today! So easy and delicious, my favorite kind of dish. While the menus at both the Restaurant and Café are constantly changing with the seasons, there are a few of my favorite dishes that they keep on the menu nearly year round and I thought I would share with you. Beef Carpaccio- One of the best out there. The beef is sliced perfectly delicate, served with peppery arugula, parmesan shavings and horseradish cream. Parmesan Soufflé- So light and fluffy, but rich all at the same time. The little bites of prosciutto make this dish. Cappellini Bottega- Super simple and packed with flavor. My favorite part of this dish is the kick from the dried whole red peppers hanging in the pasta. Baked Feta- A block of feta with basil and spicy marinara. I will definitely be posting this recipe soon on the blog when I can master my focaccia bread. Conecuh Sausage Pizza- I am a sucker for any pizza to be perfectly honest, but this pizza has Conecuh County sausage on it. If you're from Alabama like myself, you know that there is no better smoked sausage than Conecuh County. So just imagine this sausage on a pizza, unreal. Café Mac & Cheese- Rich, creamy and sinful. The way all macaroni and cheese should be. Served with a lovely green salad to make you feel better about the caloric intake of the pasta. 2. Place red peppers on baking sheet and let roast for about 20-30 minutes, or until the skins are browned and pulling away from the flesh. 3. Put the red peppers in a brown sat and let them steam to loosen the skin even more for about 15 minutes. 4. When the peppers have steamed and slightly cooled, take them out of the bag and remove as much skin as possible (some char marks are fine, you want them!) Then take out the seeds and stem. 5. Place the peppers peeled side down on a cutting board and cut slit so you can lay the pepper flat open. 6. 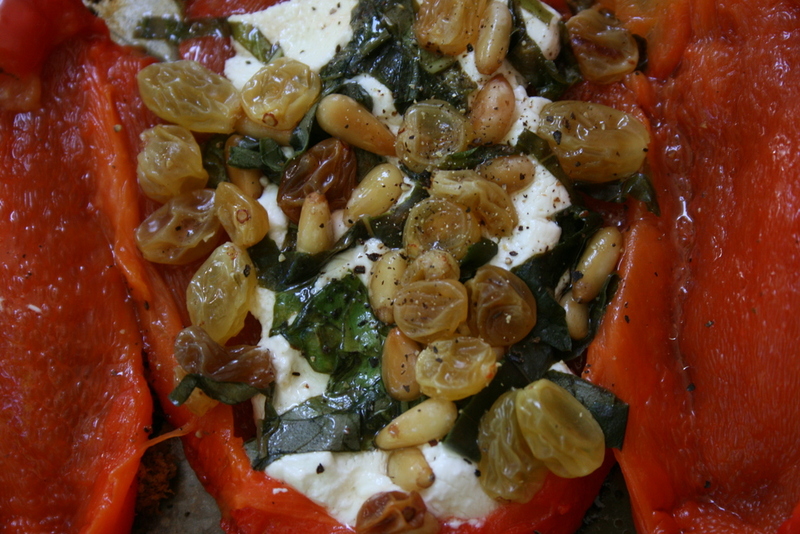 Sprinkle each pepper with S & P. Spread 1/4 of the goat cheese down the center of each pepper, followed by the pine nuts, raisins and finally basil. 7. Fold each pepper’s flaps to the center to create a package-like pepper. 8. 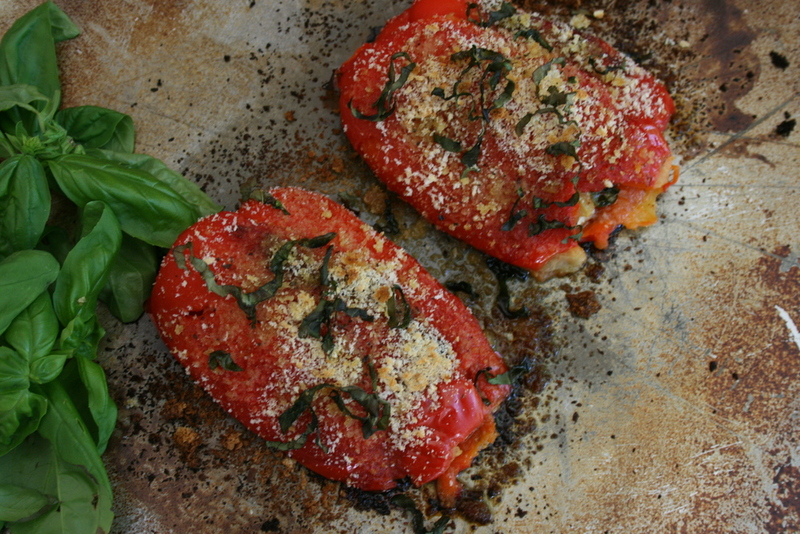 Place the peppers on a baking sheet, sprinkle the tops with breadcrumbs, drizzle with olive oil and top with the remaining basil. 9. Bake in the oven until the bread crumbs brown and the cheese is hot and bubbly, about 10 minutes.